Maybe they'll change the saying about horse feathers to peacock feathers. Recently Jim helped me set up for an out of town show and his comment was that they looked like eyes. Myself, I don't really see that. I just love how they change colors depending on the light. And, they let me incorporate all my new glaze tests together. Lights, camera, action........These were a few scenes from a video that was shot in the studio last week. I had been contacted about being filmed while throwing chalices as background for a musical video. The big lights, multiple cameras and creating pieces for the scenes were all exciting. Knowing what they wanted to film, I made chalices beforehand that would be ready to carve and then threw new pieces so all parts of the process could be shown. It will be fun to see how it all comes out. My hands were the stars! The beginning of a new series of clay baskets. I'm using different texturing methods. These were done by cutting strips of clay from a big slab, then using an MKM roller to texture one side of the strips. I love the crisp patterns these rollers make. A limited number of them may be available at the next show, May 17th, in Winston Salem. We'll see what happens in the kiln firings this week. An oil container from Italy. Thought it was so clever. The rim around the spout has a little hole in it so any drips can seep back into the bottle. These are images from the gallery space in the studio. 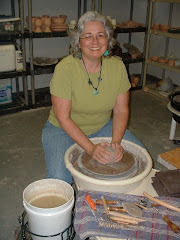 I have been updating various online presences for Bluegill Pottery and posting casual shots of the gallery. Had a great show this weekend in Charlotte and saw lots of folks from over the years who have bought my pottery. These are scenes before the bottom dropped out of the sky. Got everything packed up and loaded in the deluge and thunder and made it home soaked to the skin but happy. My shop/studio is situated along a very busy highway now, but years ago it was not as developed. My next door neighbor has been there for about 50 years and planted young sapling which have grown into massive trees. These pictures are from a month ago when their dogwood--a pink and white variety was in full, glorious bloom. I have to assume that this tree was once just a pink dogwood and has now resorted back to it's orginal white stock, which it must have been grafted on. Anyway, the combo is striking and lovely.